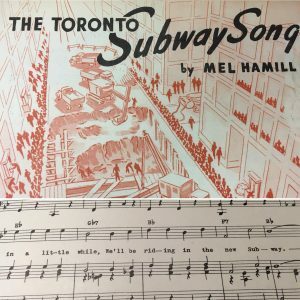 Mel Hamill composed The Toronto Subway Song in 1950 during the construction of the city’s first subway. In less than a week, travel to the university will reach rocket speeds with the opening of two subway stations on campus. While the commute nowadays may be described as rough, try and think back to the opening of Keele Campus in 1965 when the Bloor-Danforth line was still under construction. In fact, back then, the subway climbed no further north than St. George and Eglinton stations! The commute to York University sure has changed over the years. 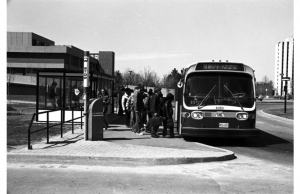 Coinciding with the arrival of the first cohort of students, the Toronto Transit Commission (TTC) established the 41 Keele route which ended, not at a subway station, but Davenport Road and Lansdowne Avenue. Around the same time, to better serve the area the 36 Finch service was extended to Weston. It would take four more years before the 60 Steeles route was inaugurated in 1969. Commutes often required multiple transfers to reach the university. After the long commute, riders faced a one-kilometre trek to campus from the closest bus stop at Keele Street. Without Schulich, York Lanes, and the East/West Accolade buildings to block the wind, the walk would have been a chilly one! 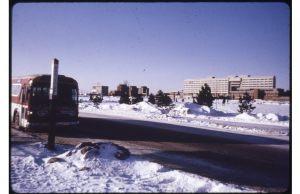 If you were lucky, during rush hours on weekdays, you could catch the 41B route which circled the campus on Fraser Drive (now primarily Ian MacDonald Boulevard and Pond Road). Seeing these images, one can understand why students, staff, and faculty often advocated for increased service with initiatives such as a campus-wide petition organized by the Excalibur to “get York put on a full-time route”. Advocacy initiatives included this campus-wide petition organized by Excalibur. Smith, Jim. Excalibur. “T.T.C. Petition.” Excalibur, 10 February 1967. 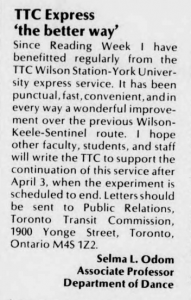 After the cancellation of the Spadina Expressway in 1971, students believed mass transit to campus would soon follow and they were partially correct. During the 1970s, the TTC extended the subway northbound three times. First, in 1973, the Yonge line climbed to York Mills station and then, a year later, to Finch station. A call to write letters to support express service. 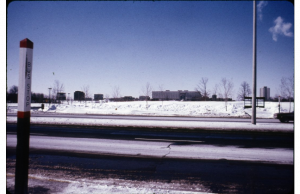 The newly established 106 York University route started at Wilson station, not Downsview. The bus shared public roads with traffic (the dedicated busway opened in 2009). Express service did not exist for another two years. Fortunately, in 1980, the TTC decided to test ridership on an express service (the 106E) with a five-week trial period. During this time, the community successfully rallied for the continuation and expansion of the 106E. The two proposed stations veer slightly southwest from today’s subway stations. 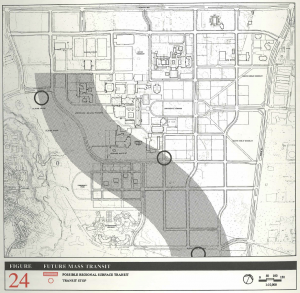 An announced subway expansion to the university (funding was withdrawn three years later). Regular bus service to York Lanes eliminated the hike to Keele Street. Then, in 1996, the TTC expanded the Spadina line to Downsview station. With it, commuters avoided two long kilometres of traffic as the 106 relocated north to the new station. 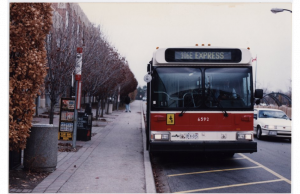 In 1999, those coming from Sheppard station rejoiced when the 106E was replaced with the 196 Rocket which took a more direct route to campus. When the busway opened as the GTA’s first major bus-only road in 2009, the commute to Downsview shortened to a mere fifteen minutes – if there were no problems on Dufferin. More importantly, that same year, the TTC approved the York University station design concepts! With tunnel boring for the subway extension beginning in 2013 and completing in 2016, the university community was that much closer to achieving their dream of a subway on campus. While students are excited, we can also imagine that our researchers are excited about catching a ride on the subway to our reading room. Hope to see you soon! Calnan, John F. “041 Keele History Map.” Transit Toronto. (Accessed November 11, 2017): 8. https://transit.toronto.on.ca/bus/routes/images/041-keele-history-map.pdf. York University Libraries, Clara Thomas Archives & Special Collections, Office of the President fonds (F073), Accession 1977-013/071 (2084). Accessed November 27, 2017. Letter from a graduate student to the University President. November 30, 1970. After a gradual increase from the introduction of evening drop-offs at the Ross Humanities Building in 1987.